Francis Frederick, b. 1809? Autobiography of Rev. 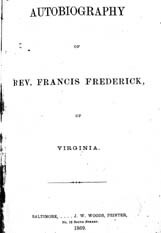 Francis Frederick, of Virginia. Autobiography of Rev. Francis Frederick, of Virginia. Baltimore: J. W. Woods, Printer, 1869. African Americans -- Religious life. The John Work Garrett Library of The Johns Hopkins University provided the text for the electronic publication of this title.